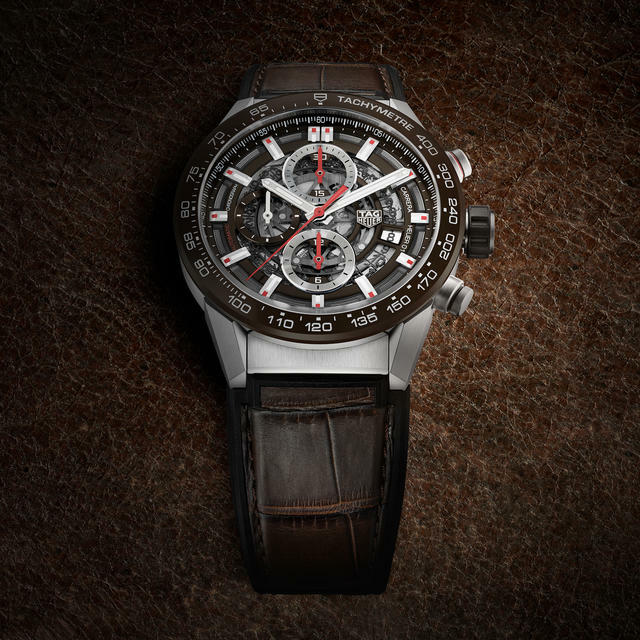 Two years after TAG Heuer unveiled a skeletonized Carrera Heuer-01 with an in-house chronograph caliber and a nice price (currently $5,300), the Swiss watch company plans to expand the Carrera collection with three slightly smaller versions of that earlier watch, each available on a leather strap or on a steel bracelet. A full black ceramic edition, not yet pictured, will also be added to the collection. At Baselworld 2017 TAG Heuer will debut the Carrera Heuer-01 43mm, with, as the name suggests, a smaller case diameter of 43mm and in a choice of hues: black, navy blue and cognac brown. These are not the first 43mm Carreras with the Heuer-01 chronograph caliber inside, but they are the first 43mm models with skeletonized cases. The in-house column-wheel chronograph caliber Heuer-01 is here set into a modular case (also made in-house) that retains the contemporary skeleton design of the larger models but replaces the earlier steel tachymeter bezels with ceramic bezels. The new bezels appear to be just a bit thinner than those on the 45mm model. The new color options, seen primarily on the new bezels, also extend to the small seconds counter, the inner flange, the logo and the date window. The new polished ceramic bezel nicely contrasts with the satin-finished twelve-part modular case. Indeed, the modular nature of the case, influenced by its LVMH cousins at Hublot, allows TAG Heuer to vary the case’s overall design. 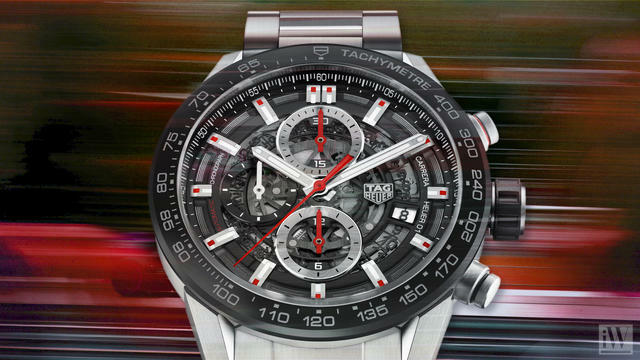 Consider this new model as only the latest example of how TAG Heuer can, and likely will, continue to develop options within this contemporary Carrera collection. 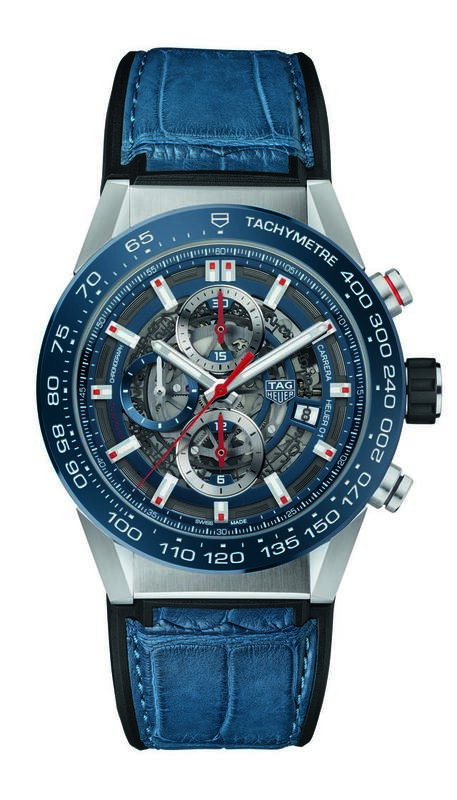 TAG Heuer has already indicated that we’ll see a black ceramic-cased version of this 43mm model during Baselworld. As a skeletonized model, the Carrera Heuer-01 43 mm allows its chronograph operating levers and date disc to be viewed from the dial side. The color red identifies all of the movement's chronograph functions, including the central seconds, the 30-minute counter, the 12-hour counter and the start/stop pusher. Through the clear sapphire caseback the wearer can eye the red column wheel, the skeleton chronograph bridge and circular black PVD rotor. Prices: Starting at $4,950. Blue, brown or black flange with 60-second scale. • Small seconds counter at 9 o'clock with blue, brown or black snailed ring and polished, rhodium-plated hand. 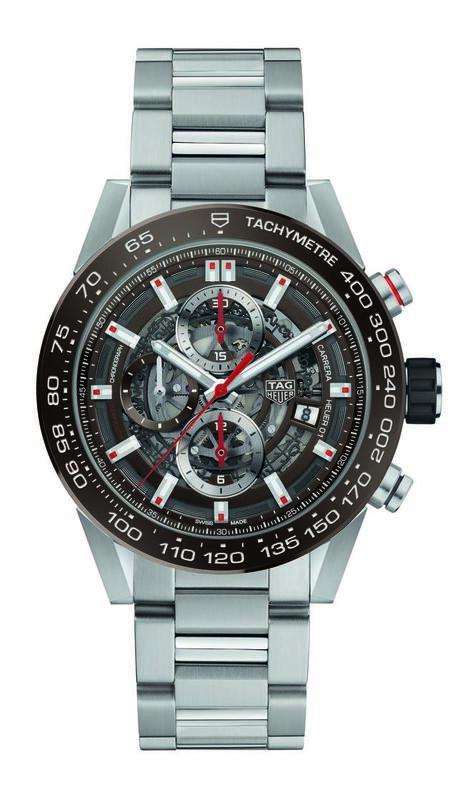 • Rhodium-plated hour and minute hands and indices with white Superluminova, red small seconds hand, polished rhodium-plated "TAG Heuer" logo at 3 o'clock. • Inscription of "CARRERA HEUER 01 CHRONOGRAPH AUTOMATIC"
Steel or grade 2 titanium folding buckle covered in black PVD with safety push buttons and TAG Heuer logo.